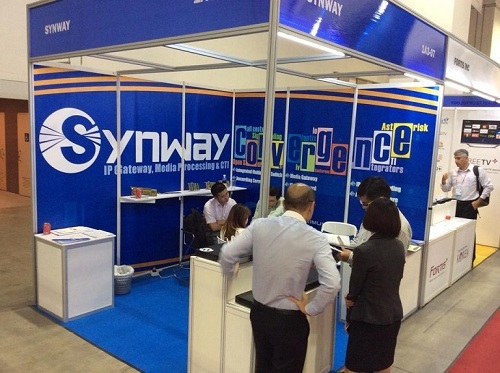 Marina Bay Sands, Singapore/JUNE17, 2014—HANGZHOU SYNWAY, a world-leading manufacturer and supplier of VOIP products and solutions headquartered in Hangzhou, China attended the 25th International Communications and Information Technology Exhibition & Conference in Singapore. During the exhibition, Synway’s newly designed SMG Gateway was a great hit and attracted a large number of visitors to our booth, some of which even showed huge interests and strong decisions to have a long-term collaboration with Synway in the days ahead. The SMG gateway includes Analog Access Gataway and Digital Gateway. With a simple and economical way to help legacy telephone, fax machine and PBXs interconnect with IP network, SMG1000 analog media gateway enables call center and multi-branch enterprises to possess powerful, versatile and efficient VoIP solutions with unparalleled cost advantages. Providing low-to-high scalability(32-512 IP Chs) in a compact 1U chassis, the SMG2000/3000 can deliver SIP services into SS7, ISDN PRI,and SIP networks efficiently and interoperably. Years of professional signaling and voice technology also makes it more reliable and stable for large capacity call centers(IBD/OBD) and multiple branches and can be seamlessly interconnected under extreme network environments. It is the 10th time Synway attended the grand gala in Singapore and they were quite confident that their SMG gateway would boost both domestic and overseas sales and further address the existing issues in IT communications. As a major manufacturer and supplier of communication products and solutions, Synway specializes in providing superior Multimedia Gateway, Integrated Multimedia Switch, Telephony Hardware in use for Telecom communications. Since 1995, over 3,000 service providers, software developers and system integrators have deployed Synway’s offerings to deliver a broad range of TDM and VoIP-based applications worldwide, including Unified Communications, SIP Trunking, Call Center, Mobile VAS, Faxing, Conferencing, Call Recording as well as Asterisk-based Open Source Applications. CommunicAsia2014 is the largest platform in Asia’s Information Communication Technology(ICT) industry and serves as a very important role for IT professionals coming afar to get timely knowledge about industry status as well as its future. With the rising of national IT industry and its unique location, Singapore becomes a wonderland for merchants and software integrators worldwide, where numerous opportunities are provided, long-term and friendly business partnerships are built. Over the past years, the CommunicAsia has attracted a great number of attenders and attendees, including many world-leading enterprises such as Altek Corporation、DIGILINK、Inmarsat、Skype、Yahoo! 、ZTE etc.